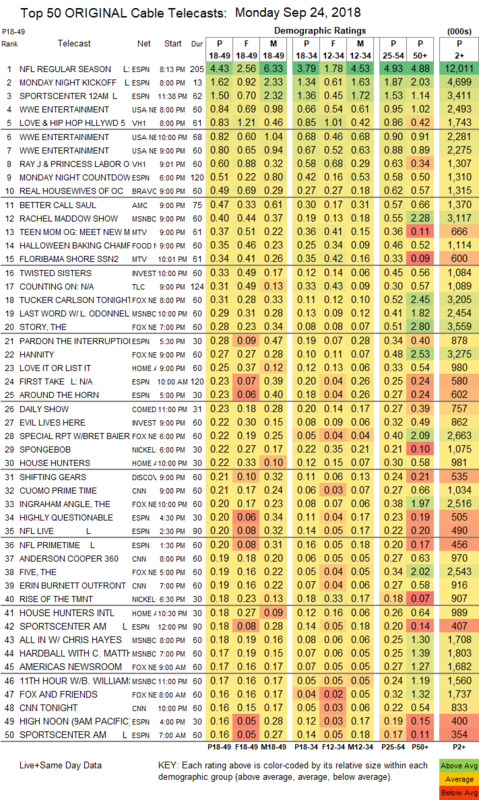 NETWORK FINALS: As expected, football adjustment lowered DANCING WITH THE STARS and THE GOOD DOCTOR by 0.1 each. In addition, THE BIG BANG THEORY gained 0.1 in final numbers. CABLE HIGHLIGHTS: ESPN’s MONDAY NIGHT FOOTBALL featured Pittsburgh vs. Tampa Bay, and at 4.43 it was up 0.44 from last week’s game. 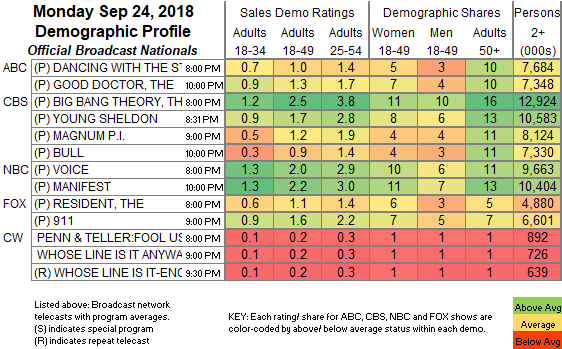 USA’s WWE telecast was at 0.84/0.82/0.80, compared to last week’s 0.96/0.90/0.85. On VH1, LOVE & HIP-HOP fell 0.18 to 0.83, and RAY J & PRINCESS LABOR OF LOVE was at 0.60. Bravo’s REAL HOUSEWIVES OF ORANGE COUNTY lost 0.07 to 0.49. On AMC, BETTER CALL SAUL rose 0.06 to 0.47, and LODGE 49 ticked up to 0.49. MSNBC’s RACHEL MADDOW SHOW led cable news in the 18-49 demo at 0.40/0.55/3.1M despite Fox News’s Brett Kavanaugh interview; that network was topped by TUCKER CARLSON TONIGHT at 0.31/0.52/3.2M, with CNN’s CUOMO PRIME TIME at 0.21/0.27/1M. On MTV, TEEN MOM ticked up to 0.37, and FLORIBAMA SHORE was steady at 0.34. Food Network’s HALLOWEEN BAKING CHAMPIONSHIP was at 0.35. On ID, TWISTED SISTERS climbed 0.07 to 0.33, and EVIL LIVES HERE was down 0.06 to 0.22. TLC’s COUNTING ON edged up 0.02 to 0.31. On HGTV, LOVE IT OR LIST IT fell 0.06 to 0.25, HOUSE HUNTERS lost 0.05 to 0.22, and HOUSE HUNTERS INTL was down 0.03 to 0.18. On Discovery, SHIFTING GEARS arrived at 0.21, and a VEGAS RAT RODS special was at 0.16. HBO’s documentary JANE FONDA IN FIVE ACTS premiered at 0.08.